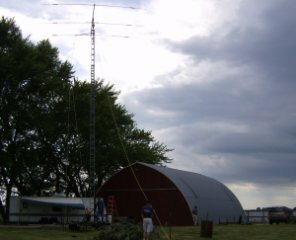 The 2006 RARC Field Day was held on the weekend of June 24-25 at the home QTH of NØADQ in eastern Dodge County. The club operated a CW station, a SSB phone station, two VHF/UHF stations, digital PSK-31 station and a GOTA (Get On The Air) station during the weekend event. Thirty-six club and non-club hams participated in the 2006 RARC Field Day activity. The storm was a good exercise in what conditions may be like in an emergency event. Operators scurried to shelter their ham gear, and bring antennas down before the lightning hit. Wind blew down the VHF Station #2 tent. Though mother nature did not exactly cooperate throughout field day, we did not let the rain and wind dampen our spirits. Roger Kroupa (WBØISF) was kind enough to once again lend a helping hand with dinner preparations (wielding his BBQ supplies and his awesome looking trailored grill.) The club, family and friends enjoyed hotdogs and hamburgers while things began to dry off from the day's rain. Thanks to all who contributed to the cookout by bringing food, beverages or supplies. The auction was a good deal for the club and for its members. The club was able to make some extra money on its surplus equipment, and members were able to purchase inexpensive equipment. After the auction, people began to operate again. The VHF Station #2 finally got on the air, and had its first contact: with South Texas. The next morning, John Scott (NØHZN) and Kari Ann Funkhouser (KCØWIP) were kind enough to make breakfast. Though some of us did not want to leave 6 meters operations (by early morning it was really open), we took time out to enjoy pancakes, eggs, potatos and sausage. It was good timing, because it started to rain once again after breakfast. 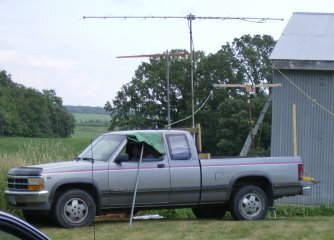 Steve (WØSTV) quickly presented FSTV and APRS trying to outpace the approaching rain. 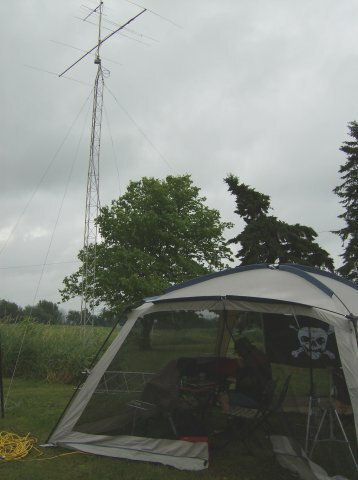 Continuing to work from our operating shelters (all the while trying to keep our ham gear dry), we continued to rack up QSOs until 1:00pm on Sunday 6/25. 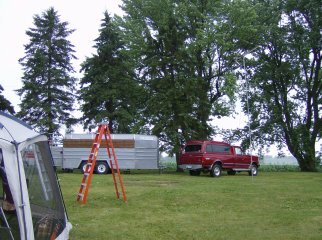 At 1:00, the rain conveniently began to lighten up, and we began to tear down the field day site. Thanks again to all who helped with the RARC field day. I can not express how much I appreciate your help in making this event a success once again. Field day would not have happened without you. Following photos provided by Brad AIØBP. 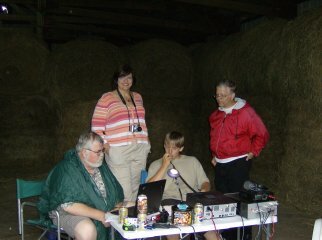 RARC Field Day site at the Dodge county QTH of Pat NØADQ. Digital and SSB phone stations were located in trailer in background. 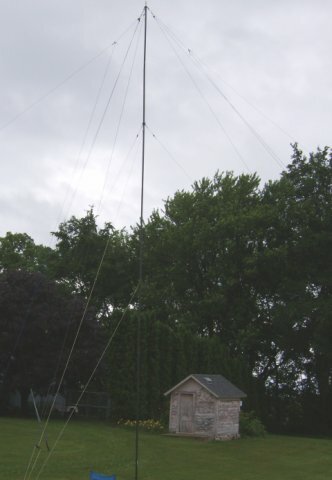 Mel's (KCØP) rover station which acted as VHF station #1. Randall Trapp's monitoring station, and Peter Cross (WØSA) operating the CW station in the far trailer.